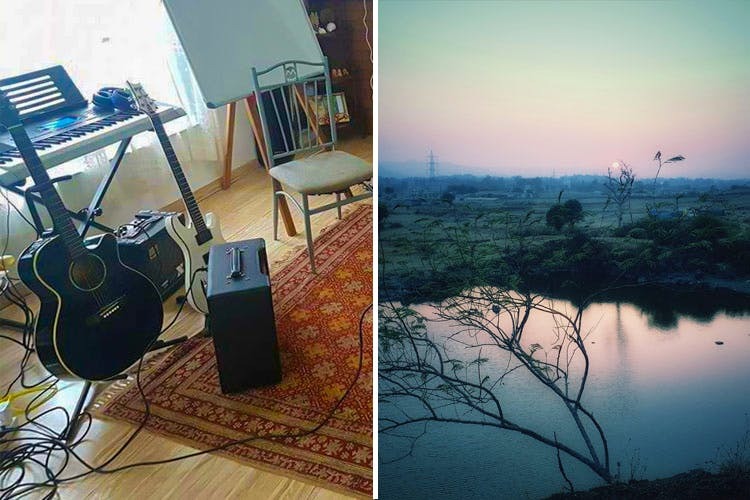 Just off the old Mumbai-Pune highway is a home that has been converted into a music gurukul that gives you a unique experience of learning how to play the guitar over the span of two days or more. The modern-day Guitar Gurukul was started by music enthusiast Abhishek Shah who decided to put behind his thriving career and conduct workshops for those who are serious about learning how to play. The students get a chance to live in his house, share, learn, listen to different of music and practice over the span of two days. Apart from this, you get to do nature treks with him, cook meals together, practice some early morning yoga for some peace and serenity and also have 3-4 solid music sessions. When asked about why his institute is called the Gurukul, Abhishek had something very interesting to say. In the olden days, gurukuls were places where a student would stay with his teacher till a certain amount of knowledge was achieved and then go out and pass it on. He also mentioned that in other classes that students take or even if there is a teacher coming home once a week, students forget what they’ve learnt, being engrossed in their day-to-day activities. This usually gets them back to square one, with them having to practice all over again. Hence, the term Gurukul, where serious students, who really want to learn how to play, spend some time and pick up these skills till the muscle memory kicks in and they’re able to recall it on their own. Abhishek’s home is in the midst of nature, surrounded by lush greenery and mountains. So, you’re sure to have a soulful experience here, and you’re promised a lot of peace and quiet, ideal to pick up those skills. He also plans activities that help you open the emotional section of your mind so that you are open to receive music. Once you’re done with your training, you can visit him whenever you like to learn something new. Also, at the time of your training there, he goes about preparing meals for you and listening to you practice till you get it right. He also makes video logs to show you how you can improve your style; so that once you go back, you have your conceptual understanding in place and get your internal timing correct. If you’re a music enthusiast and are serious about learning how to play, you should definitely give this a shot! It’s an experience that is sure to elevate your spirits if nothing else, and in the meanwhile, you can pick up some sick guitar skills. You can email him on abhishek.echoes@gmail.com for further details.